Take a close look at this simply amazing design concept. Yes, you are seeing right. 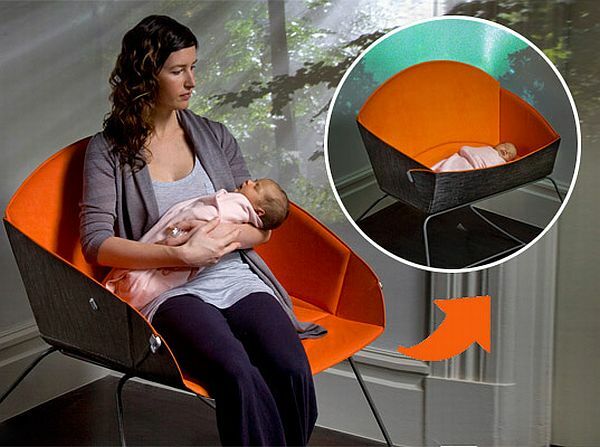 It’s a rocker seat that transforms into a bassinet. Just how ingenious is that?! California-based Lunar hit the nail on the head with this idea. Minimalist, simple, yet just so useful, the Koo debuted at the International Contemporary Furniture Fair in May and you can see why many a mother was fawning over it. Baby goes to sleep in it, when it’s time for that bleary-eyed night-time feed, a one-handed manoeuvre turns the rocker bassinet into a comfy chair and back again when you’re finished. Lunar plan to incorporate the Koo into a universal nursery system, with ideas such as a tree stand that acts as a mobile, baby monitor and sound-activated bottle warmer/cooler in one. It’s all still in the pipeline but of course we’ll let you know if and when Koo goes into production. In the meantime, check out the video below for a glimpse into tomorrow’s babyworld!